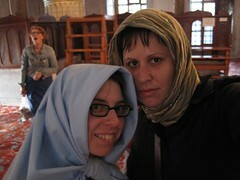 in the blue mosque. LIsa forgot to bring a scarf that day, so i gave her the one i was wearing, so i ended up wearing a sheet. pretty silly looking, but still, respectful i think. i love the crazy woman behind us in this one. when we were in the blue mosque there was a couple who had a camera and appeared to be filming one of the worshippers which i was shocked at, and couldn't figure out why no one stopped them.... until the guy finished praying and walked over to them and took the camera from them and thanked them!